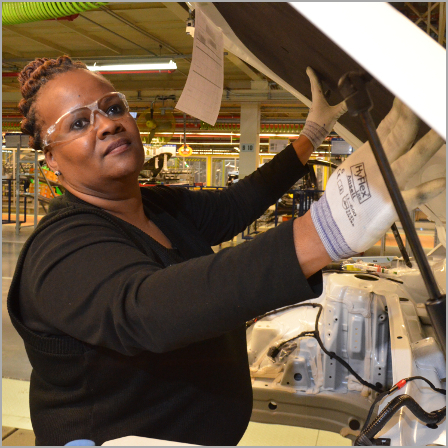 HMMA Team Member: Pat Means | Hyundai Motor Manufacturing Alabama,LLC. Pat Means has been an HMMA Team Member in general assembly since January 4, 2004. When she began her tenure with Hyundai 11 years ago, she was among the first group of HMMA Team Members that were sent to Korea for a month of hands-on training. The on-the-job training provided these Team Members with a set of skills they would need to come back and help train their coworkers. They learned everything about how to assemble a vehicle, down to the basics like knowing the best techniques for holding a tool or bolt. When Pat came back to Alabama, she was promoted to team leader in the Trim area. There, she and her fellow Team Members had the unique responsibility of determining which tasks would be completed at each work station. “We had to determine the order for every part to be put on, so that, for instance, you wouldn’t be putting a patch on and then have to take it back off later to put a screw underneath it,” she said. It was a huge task, but Pat knows the work they did back then truly laid the foundation for a successful and efficient assembly process on the trim lines, where she is now a group leader. “It makes you feel proud to know that what we did has contributed to all of HMMA’s milestones, like the first car, or the first million cars,” said Pat. When she reflects on her years at HMMA and all those milestones she has helped achieve, Pat says she’s thankful to be a part of the Hyundai team. Pat’s motivation and dedication to building a vehicle of the highest quality is a characteristic shared by many Team Members, and it’s what makes HMMA a truly remarkable place.